Studio headphones usually don’t come cheap. In fact, there are models that cost way beyond $1000. If you’re on a budget and need a set of these cans for your rehearsals, mixing, or any other type of studio work, you’ve come to the right place. Let’s be frank, cheap studio headphones could never match the sonic performance of expensive models – cheap drivers will only give you so much, flimsy construction materials are a commonplace, and generally, the market is just so vast that the majority of ‘cheap’ models aren’t worth it. Luckily for you, we’ve taken the time to do a thorough research and have come up with a list of the best cheap studio headphones for your leisure. Enjoy our picks! Our first pick is Sony’s MDRV6. Though this brand is famous for delivering premium-quality products, this is one of their cheaper cans that actually work pretty well in the studio. Of course, bleeding-edge technologies weren’t totally excluded, as this model packs 40mm neodymium magnets, a broad frequency response range, and a decently comfortable design. One of the best things about MDRV6 headphones is that they don’t put up a lot of clamping pressure, so they feel decently good even after hours of wearing. The soundstage is decently balanced considering the price, and sonically they perform well beyond average. The bad thing about them, however, is that they’re kind of uncomfortable for commuting due to the heavy cable. It also lacks inline controls, so it’s not exactly easy to use them in these situations. That’s just another reason why they’re so good for studios, though. 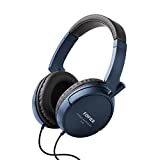 So, the bottom line is that these headphones are a bit old, their versatility leaves a lot to be desired, but they sport high-quality drivers and a big frequency response range. That being said, they’re more than worth the money. Next on the menu is KRK’s KNS 6400 on-ear closed back monitor headphone set. Although not exactly cheaper than Sony’s cans, these headphones pack quite a punch for the buck due to being equipped with high-quality features and premium technologies. They come supplied with medium sized cups padded with memory foam. The headband also features a pad of this kind, so these headphones are decently comfortable to wear, even for hours non stop. Additionally, the band is relatively flexible, and the cups can swivel up to 90-degrees, but the overall construction lags a bit in terms of durability. The soundstage of KNS 6400 is extremely balanced, and the sound signature neutral, though certain things could’ve been done better sound wise. First and most importantly, the bass is a bit low and unpronounced – you won’t feel this lack of bass in certain music genres, but it’s pretty weak altogether. That’s the reason why you’ll need a good EQ to set things properly. Virtually any mixing console could make them sound pretty awesome, though. Sleek, comfortable, and very reliable when it comes to studio work – those would be the words that best describe Cowin’s E7 Pro in a nutshell. These cans are absolutely phenomenal and excel in pretty much every field of performance. In terms of design, they pack a beautiful design, and what’s even better is that they come in several colour variations, including black, blue, green, pink, purple, red, and white. The entire construction looks amazing, but the cups especially so, even though they’re a bit smaller than average, so they put up a slightly higher level of clamping pressure. In terms of ambient noise reduction, the E7 Pro sports Active sound cancelling technology, meaning that it is ideal for both studio work and casual listening. By activating this feature, you will be able to negate almost all ambient noises and sounds, leaving you to work or listen to your music in peace. Even though we did mention that the earcups are somewhat smaller than average, they feature incredibly soft cushions and can swivel up to 90 degrees. If they were only a bit larger, most people would say that they were perfect, but even so they’re pretty great for the money. Sound wise, the E7 pro comes with 45 large aperture drivers that deliver exceptionally deep bass and a crispy soundstage. There’s also an onboard microphone integrated in the construction which you can consider as a bonus feature since it will be of little use in the actual studio work. The bottom line is that these cans are more than worth the money – they look gorgeous, they sound amazing, and they’re versatile enough to be used in several ways aside from strictly jobs in studio such as critical listening, mixing, and monitoring. Next up is Samson’s SR850 semi open set of studio headphones. Though they don’t look as beautiful as Cowin’s E7 Pro, they surely do bring other benefits to the table, such as exceptional frequency response, super big drivers, and superior passive noise isolation. The first thing you’ll notice about these headphones is that they were specifically built for studio work and critical listening. They come with a relatively short cable, which means that casual listening and commuting with them might be a bit uncomfortable. What’s great about them is the adjustable headband complemented by the slightly oversized earcups. Namely, these two features ensure long-term comfort, so you can rest assured that you’ll be able to monitor and mix your tracks for hours without experiencing ear fatigue. The big driver units we mentioned are 50mm drivers that provide a frequency response range that spans from 10Hz to 30000Hz. The lows could’ve been done a little better, but the midrange and the high section are both equally amazing. Basically, if you’re looking for cheap studio headphones, you might as well give Samson’s SR850 open back cans a shot. Right after Samson we’re moving on to Rockville’s Pro-M50. In terms of design, they resemble Audio Technica’s style a lot, which is pretty awesome in regard to aesthetics and build quality. They’re made of highly durable yet decently elastic plastic materials, the headband also packs leather reinforcement for added durability and comfort. Simply put, they’re definitely built to last. The cable is decently long, which comes surprisingly handy for casual listening and commuting. It’s also detachable and decently robust. Sound wise, these cans perform rather great sonically, although there’s some room for improvement concerning the high section. One of the best things about these headphones is that they come exceptionally cheap. They cost only half as much when compared to earlier models we’ve reviewed. Next up is Edifier’s H840. Though these cans don’t pack a lot of features, they look great, they’re durable, and perform exceptionally well in studio environment. 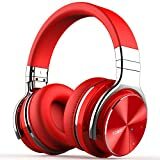 In essence, the H840 headphones are low budget cans that sport an elegant design, a set of comfortable earcups, and a rather long cable that can be used with smart devices and PCs. In terms of appearance, the H840 looks just great. It comes available in three colour options, including the black, blue, and white. They’re also decently durable, as the headband features leather headrests and steel reinforcement, so given proper maintenance they will last for a couple of years, to say the least. Where these cans excel the most is in terms of comfort. Namely, they feature an ergonomic over ear design and a surprisingly light build, which makes them very pleasant to wear at all times. The cups are also quite big, which means reduced clamping pressure, which is again great since you should be expecting less ear fatigue. Lastly, the K840 packs a set of 40mm drivers that were finely tuned to perfection, providing a well-rounded soundstage, deep bass, and plenty of treble. The only problem with these headphones is that the cable is perhaps too long in certain aspects, and it’s also not removable. Furthermore, some people state that the band doesn’t have enough padding, but judging by the padding on the cups, there’s plenty of comfort to be enjoyed.